Coconut oil is one of the major uses for the fruit and is seen as having a variety of applications in beauty, health, and cooking. Coconuts' remarkable levels of resilience means that they can be grown in a wide variety of soils, although they do require a relatively high amount of rainfall. The natural habitat of coconuts is found in coastal areas and on the fringes of deserts, where it is a primary source of sustenance for dwellers within these climes. The coconut is a tropical tree species, mainly grown and harvested by small-scale farmers. Production of coconuts is concentrated on island and coastal areas, such as Fiji and Samoa, as well as in the humid tropics, such as India, the Philippines, Thailand and Indonesia. The coconut is a very useful plant with a wide range of products being sourced from it. Coconut products are used to make everything from clothing to animal feed to beauty creams. Its kernel is harvested for its edible flesh and delicious water, while its husk is used for its strong fibers. Most important, however, are its oils, which are extracted, processed, and marketed for culinary, medicinal, and cosmetic uses alike. Typically, the flesh is first dried down to 6% moisture to make copra. This product is then hauled to factories across the world where it is manufactured into oil. 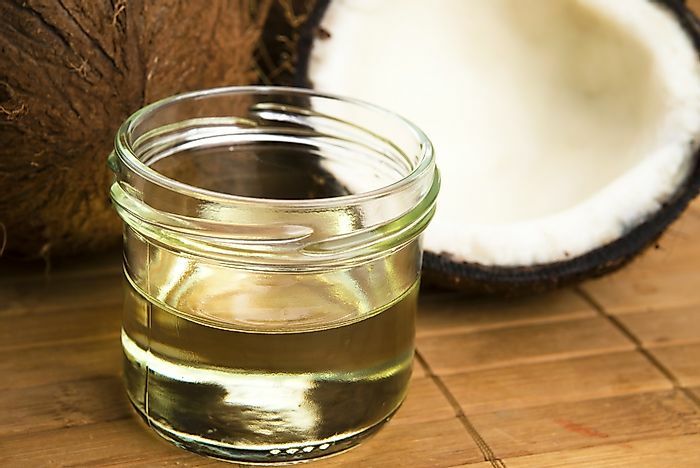 Less widely used, but more valuable, “virgin” coconut oil is directly extracted from raw coconut. Brazil was the top coconut producing country until 2010, but now three Asian producers have bettered it to take away its crown. Currently, 90% of global supply comes from Asia where it is a vital source of income for many countries. Coconut exports make up 50% of Vanuatu’s national income and 1.5 % of the Philippines’. The Solomon Islands and Samoa export mainly oil and copra, while India, The Philippines, and Sri Lanka concentrate on disseminating desiccated coconut products, and have dominated that market for over a century. The Philippines exports more than $1 billion worth of coconuts to the United States alone. Nonetheless, growth in the trade between them still lags 8% behind growth in demand. Can Supply Catch the Demand for Coconut Products? Demand for coconuts has grown upwards of 500% in the last decade. This is because coconut-based derivatives, such as soaps, virgin coconut oil, health products and coconut water, have all seen large spikes in demand, so much so that producers may not be able to keep up. The Philippines is requesting international help to streamline their production protocols, and the international community has responded by taking steps to reduce demand for coconuts. Because demand for coconuts are not being met, European markets have taken a number of steps to curb their demand. Specifically, the European Union has proposed levies on vegetable imports to the EU, they have promoted the use of alternative vegetable oils, such as palm, canola and soya, and they have put stricter aflatoxin regulations into place within the copra production market. With the measures being taken to curb runaway demand, suppliers are still making a pretty penny. Indeed, numerous foreign firms are looking to invest in the supply side of coconut production, especially in places such as Sri Lanka's ultra-productive ‘Coconut Triangle’ region. ‘Fair Trade’ practices in the industry try to ensure that the benefits of the booming sector will trickle all of the way down to small farmers, but they unfortunately keep the production rates rising at a slower rate. Lack of investment in sustaining the coconut-growing land’s productivity, largely due to the high costs associated, mean that some farms are producing 75% less fruit than they did 30 years ago. The problem of insufficient supply to meet the increased demand is not helped by the fact that many of the trees producing coconuts today are over 50 years old, 20 years past their prime production years. According to APCC (the Asian and Pacific Coconut Community), many plantations across Asia are experiencing zero growth, and some are even ceasing production as their farmers switch their focus to oil palm production. Today, the top coconut suppliers are struggling to meet the increasing demands of the global economy. Coconut has been a cash crop for decades and, even with stiff competition from other vegetable oils, it promises to continue to be a profitable venture in the future. Nonetheless, the top global coconut producers must learn from the current situation, and take steps to ensure that their farms are sustainable enough to stand the tests of time and meet future demands.